I quite liked the sound of the ship gently colliding with the piers. After a lot of obstacles, great Calypso had finally allowed us to reach our next mark. But is this really where the next clue truly is? Or is it just some over thinking by me navigator. But now that we are here, I might as well explore the isle. On the exact center was an artificial lake, and a grand palace. The ship was to be heavily guarded lest our attackers cause trouble on the docked ship. Me and firsty decided to explore the island with Nina. The navigator's theory suggested the clue to be at exact center of the isle, so to the palace we go. Rogue : Should we attack their ship Boss? Rogue Captain : I am not interested in that ship, I am interested in that map. Their Captain has it. Rogue : He just went to the island with one crew mate and his cat. Rogue Captain : Good, send in a party after them. And...stay away from that Cat. I was just at The Mumbai Renaissance a few weeks back for a food festival. Now in some sort of a re-run, I received another mail for yet another exotic food festival. This time however, it was for Tamil food. This festival lasts till the 19th of April 2019. If you didn't see me yell the same on my Twitter and Instagram, now is the perfect time to see it and grab a bite before the festival is gone. 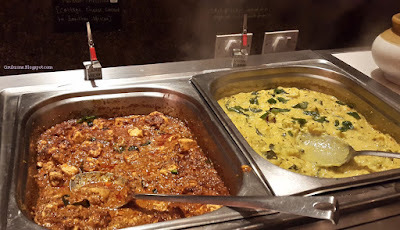 The Chettinad food festival owes its name to the Chettiar community in the Chettinad region in the Indian state of Tamil Nadu but seems to cover food from other parts of Tamil Nadu as well. The festival was hosted at the premises of the Lake view Cafe in the Renaissance although the blogger delegation was given seating in a small lake facing courtyard outside the cafe. First things first. Despite being a Tamil food festival, the restaurant had plenty of selections from a general continental fare so as to not turn off patrons who are not into the delicacies of the Chola empire. This measure had shortcomings as well. Despite having an amazing dessert selection, the buffet ironically did not have a single Tamil dessert. This was reminiscent of the experience at the Iranian fest at Nawab Saheb. The Renaissance should make sure that they cover all courses for themed food fests. 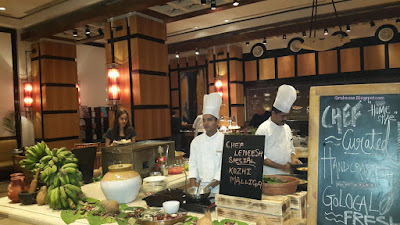 Chettinad Kozhi Biryani was a twist to the famed rice preparation I know so well. It had a distinct curried flavor along with a southern spice mix. I found it to be moderately spicy which was probably done to adapt it to all palates. True Kozhi Biryani can be a rather tongue scorching affair. Either the Biryani was lacking fried cashews or had a lower concentration of the same. Kozhi Biryani usually has cashews. Kozhi Mulaku or Red Chicken is a curry dish in Kerela. Apart from knowing that, I have never tasted or experienced this before. 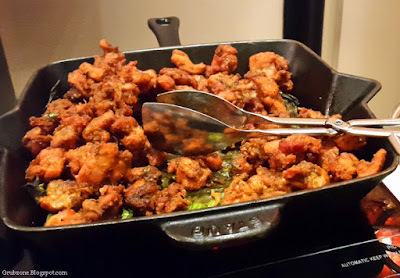 Chicken chunks were rubbed with a mix of onion and masala in this dish. 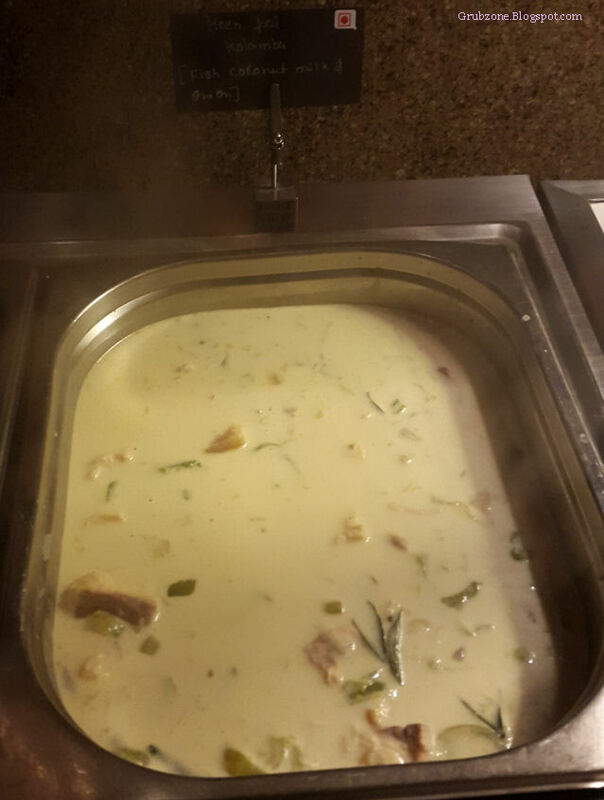 The dish tasted more mainstream than Tamilian or Keralite food however. 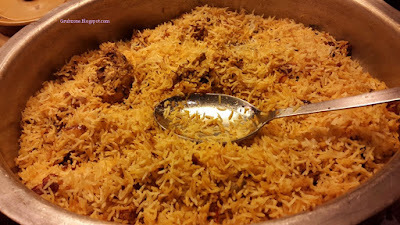 The flavor was very familiar and lacked the exotic uniqueness that was present in the Biryani. Meen Paal Kulambu - Despite not being a visually promising dish, the flavor was quite something. This tender young fish was cooked in coconut milk gravy. It had just the right amount of garlic and spices. Its flavor could touch me deepest senses as such I think of it as the real soul food. This was one of the stars of the buffet platter. Captain : This fish be tender and juicy in sweet curry. First mate : We are running out of time and you are engaging in rhyme? 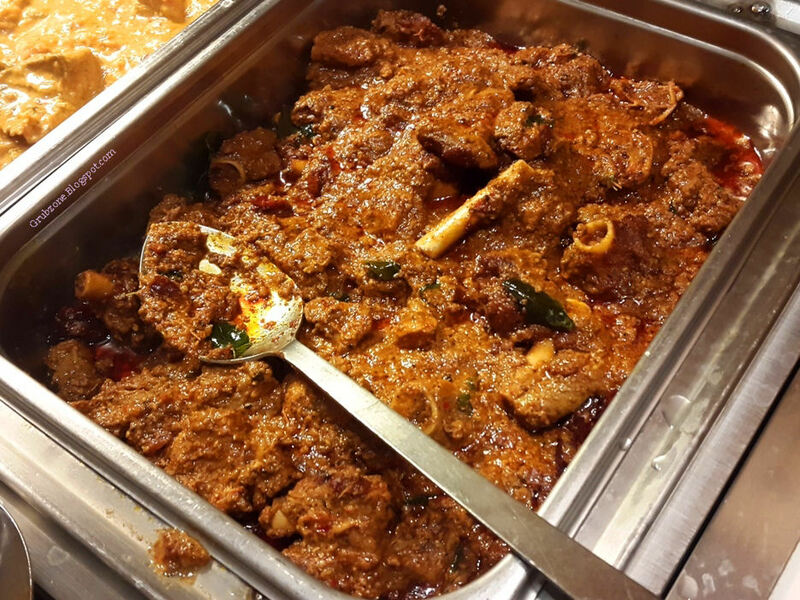 Mutton Chettinad Curry was a spicy carnivore's delight. It was thick, loaded with meat and was an explosion of Southern flavors. This was my first time with a Southern Mutton Curry. I am a regular with North Indian Mutton curries and I could easily tell that this Southern variant was a completely different dish from what I am used to. Tamilian cuisine is not as popular as the Northern ones in the mainstream. Dishes like these are literally undiscovered treasures. 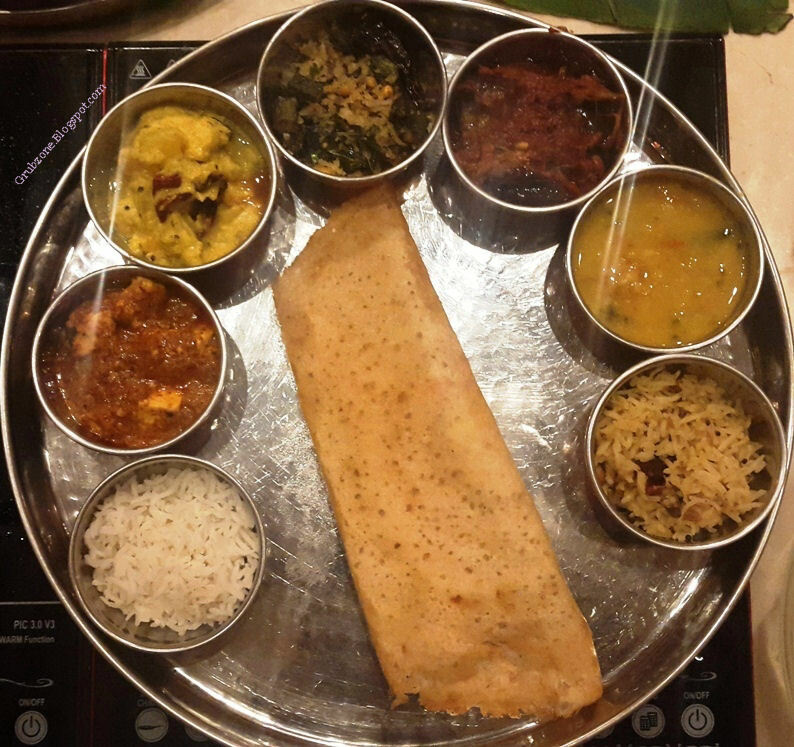 It is a shame that this dish would be near impossible to find in Mumbai after the Chettinad festival is over. Captain : This be a true sailor's grub... Oi Nina, where are you darting too? Crewmate : Go find yer furball before she causes us trouble. Captain : Eh more food for us without her. 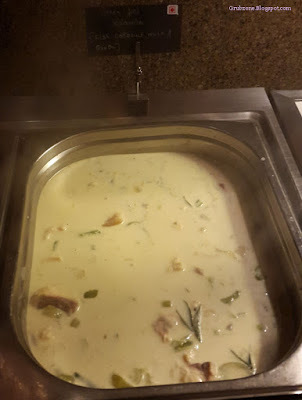 Palkatti Chettinadu - Though I avoid vegetarian dishes in Buffets, I decided to sample this just to see how the other team feels. This was cottage cheese cooked in a gravy made of onion, tomatoes, Lentils, curry leaves, hot spices and chettinad paste. It felt very similar to the mutton curry in flavor. The heat content was perhaps a notch lesser. I think it works well for a green grubber. 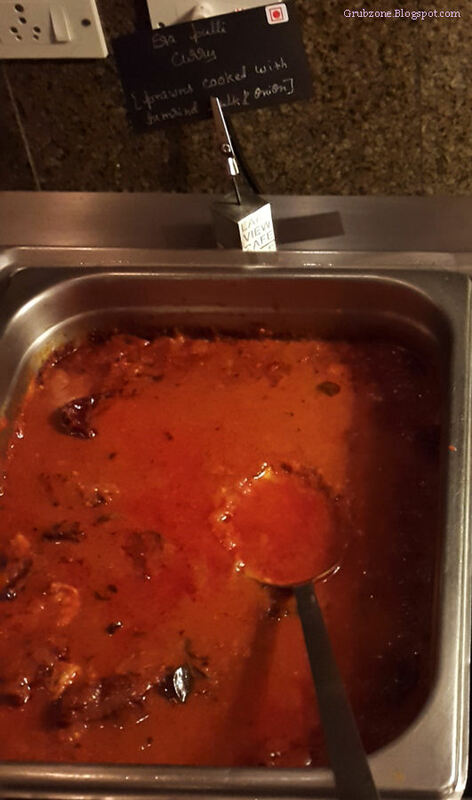 Era Pulli Curry was a tangy and spicy prawn curry which for me was the star of the night. A new flavor can often anger some and please some. While a lot of the other bloggers were unimpressed by this flavor, I found it quite to my liking. The kind of thing you smack yer lips after. Captain : (Cutlass out) You scallywags again? Rogues : Ha, There are five of us and two of you. We are gonna carve you up Game of thrones style. First Mate (Flintlock out) : Oye Oye, dont get ahead of yerselves lads. Rogues : Ha, look at you. Are you gonna beat us with seventeenth century weapons? Captain : No one disturbs me when I am eating. 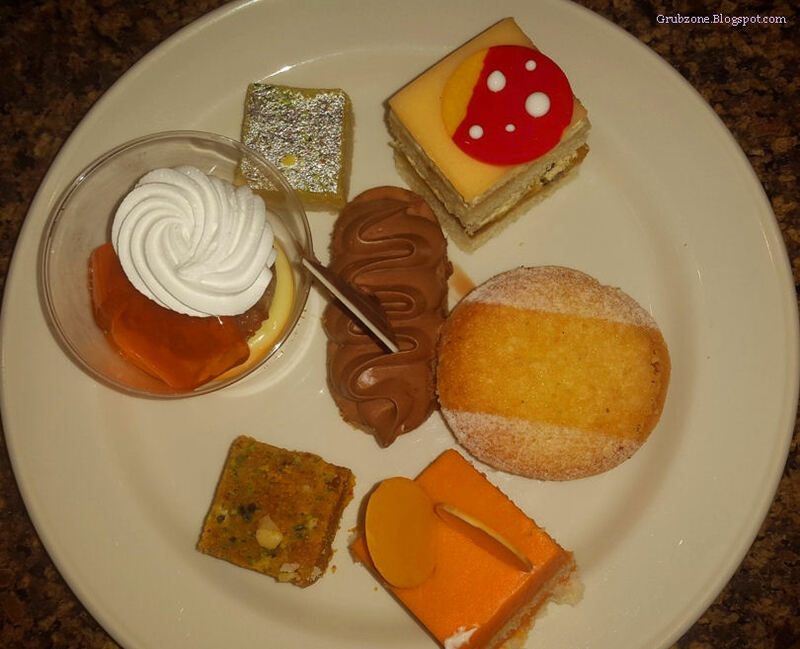 A snapshot of the western desserts at the Buffet. Shame, I could not find any traditional Tamil sweets. Not complaining here since these were quite good too but not quite Tamil. The service was the nadir of the day. The blogger bunch was made to sit in an isolated area. A server would make sorties every fifteen minutes but this caused an erosion of the experience. Dirty plates would not be removed, new cutlery would not be supplied and there was an acute shortage of drinking water. The affair could have been handled better and I feel that we should have been seated inside the cafe. It was hot, humid and uncomfortable outside. The pricing is on the higher side. 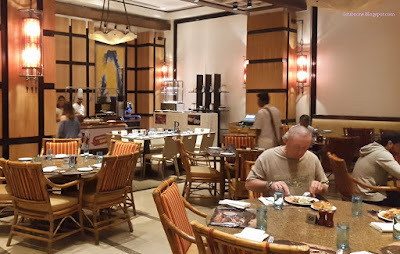 The multi faceted buffet felt like a satisfying experience though I do feel that the restaurant Captains played safe with the Tamil aspect of the buffet. 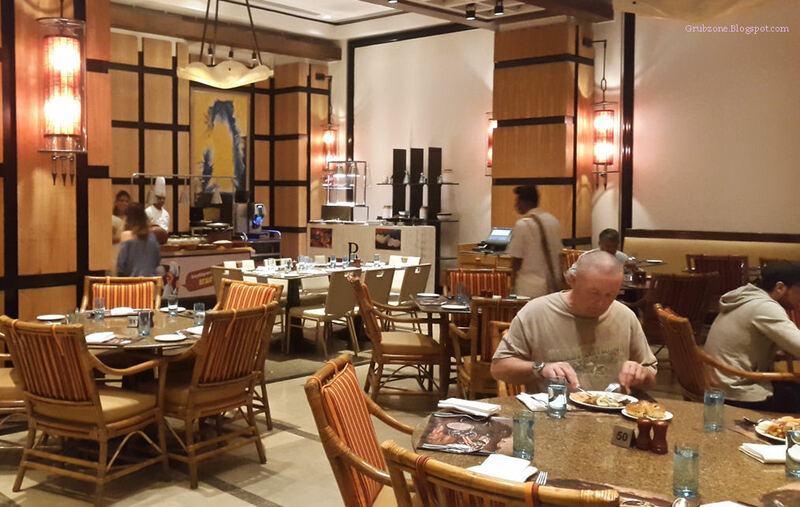 A few more Chettinad dishes and some Tamil sweet dishes won't have been such a bad idea. In totality, the experience was decent and certain dishes really excelled. Grab a bite at the Chettinad food fest before April 20. After a hard fought battle the defeated rogues retreat. Captain : Barnacles, me wound has re opened. Filthy bilge rats. First mate : I need a good drink after all this excessive violence. Captain : Where is Nina? First Mate : Who cares? Captain : Aww, she found friends. Captain : Oh come on, I need food to heal. Captain : Fine, Fine have it. First mate : Is it paying us for food? Captain : (Lifts up the coin) I think, Nina's friend just gave us our next clue. First mate : Wait what?